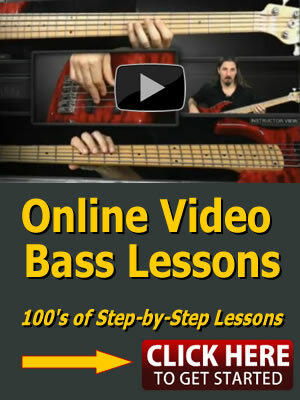 In this bass lesson you will learn what Passing Tones are and how to apply them to chord progressions. You will also be working with eighth note shuffle rhythms. Passing Tones are notes played that are non related to chords or scales in a given key. Passing Tones are ornamental in especially walking bass lines. learning in. I developed this method to take away the overwhelming distraction of the entire fingerboard! There are a total of three learning brackets which ultimately gets you to know your entire fingerboard up to the 12th fret. Root Notes are the lowest sounding note in a chord. A chord must be made up of a minimum of three different notes of a scale to qualify as a chord. Here are the Root Notes to our chart title “C Rock”. C for the C Major chord. F for the F Major chord, G for the G Major chord. There are two varieties of eighth note rhythms used: straight eighth notes and what are called shuffle eighth notes or swing eighth notes. The Shuffle rhythm is a specific 8th note rhythmic feel. It is based on triplet subdivisions of the beat rather than on dividing each beat perfectly in half. I like to call it a slanted or pushed eighth note feel. Shuffled eighth notes alternate a long sounding note and a short sounding note. The long note falls on the beat and the short one in-between on the upbeat. You are essentially playing the eighth note triplet, but not playing the middle note of the triplet and letting it ring. You may think of the first two notes of the triplet as being tied together or, just missing the middle note of the triplet. Straight eighth notes are 8th notes which evenly divide each beat or quarter note in half. Since they’re an even division, and played evenly in time they are called “straight”. The highlighted areas on the chart title “C Rock,” illustrate the Passing Tones. Watch the video to see and hear their application! Again, Passing Tones are notes borrowed from other keys and are strangers passing through the bass line to give it a Bluesy and or Jazzy effect.